Oral hygiene is something that we're both pretty hot on in our house. Having spent time as a dental nurse I am oh so familiar with the importance of looking after your teeth and gums so when I heard about the revolutionary ISSA mini* from Foreo I was really interested in giving it a go. The design of the ISSA mini* is completely different to any other toothbrush due to its silicone bristles. Not only do the bristles help to give an effective, thorough clean, but they also mean that the brush holds up to 10,000 times less bacteria than your average toothbrush. The head also only needs changing once a year as it is more hard wearing. The soft silicone head is flexible, allowing you to reach all of the harder to get to areas of the mouth and is gentle enough to use on gums to help build up their protection and help to prevent gum disease. The ISSA Mini* is targeted at adults with smaller mouths, young adults and teenagers so it has a small, compact size which makes it nice and easy to handle, unlike some other electric brushes. 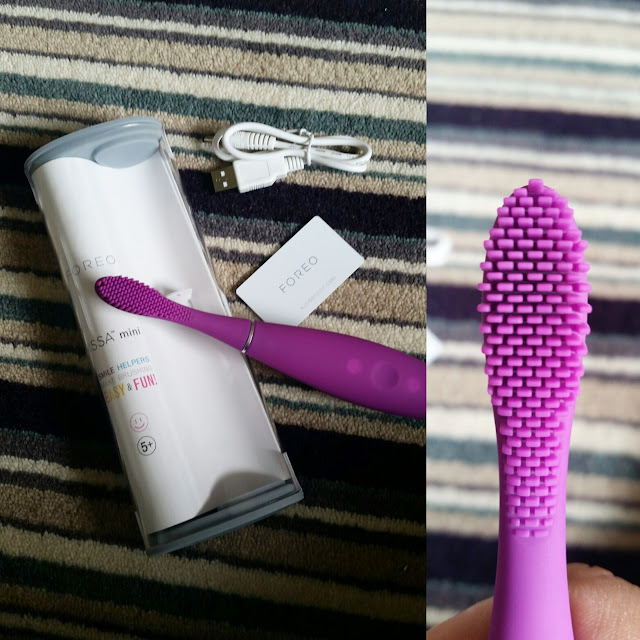 One thing that I really like about the brush is that after two minutes of brushing, the brush pulses three times to let you know that you have reached the recommended minimum brushing time. There is also a smiling face light which glows after two minutes but this is more targeted at younger brushers! I've really enjoyed using this toothbrush. It id take me a few days to get used to how gentle it feels when in use (I'm quite a vigorous brusher!) but once I had got used to it, I fell in love. It is incredibly effective, and when combined with my favourite Oral B Pro toothpaste, leaves my teeth and gums feeling lovely and clean and fresh. The battery life is great too, lasting 200 brushes before needing to be charged. It isn't by any means cheap at £89, however, I definitely think it's a worthwhile purchase, especially for anyone who prefers a softer brush or has sensitivity issues as it allows you to be thorough without being too harsh. Possibly my favourite product of the year so far.